b. 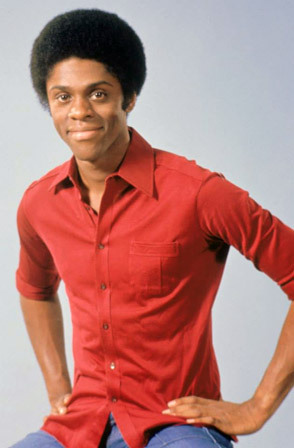 Los Angeles, California, U.S.A. Actor Lawrence Hilton-Jacobs is best known for his roles as Freddie 'Boom Boom' Washington of ABC-TV's '70's hit sitcom 'Welcome Back Kotter', Diahann Carroll's son in the 1974 movie 'Claudine', Richard 'Cochise' Morris, the high school basketball star of the classic 1975 American International Pictures movie 'Cooley High', the 1978 AIP gang flick 'Youngblood', and as Joe Jackson in the top-rated 1992 ABC-TV miniseries 'The Jacksons: The American Dream'. At the height of Kotter's success, Jacobs let it be known through interviews in such magazines as 'Right On!' and 'Black Stars' that he had aspirations of being a recording artist. One Kotter episode had him singing and playing chords on a piano. Getting a deal with ABC Records, Jacobs began working with Motown Records former songwriter Lamont Dozier. His solo debut album, 'Lawrence Hilton-Jacobs', was released in February 1978. With Dozier producing and writing most of the songs, three singles were issued. 'Fly Away to My Wonderland,' which briefly charted, the ballad 'What Kind of Man' (both were performed by Jacobs on an appearance on 'Soul Train'), and 'Love and Understanding.' One album track, a duet remake of Dexter Wansel and Bunny Sigler's 'Holdin' On' (originally on Wansel's 'What The World Is Coming To' LP) with Deborah Pratt received substantial airplay. Other highlights were 'Time Machine,' 'Wonder Woman,' and the instrumental 'Larry's Theme.' Lawrence Hilton-Jacobs briefly charted in the lower half of Billboard's soul LP chart and wasn't a sales success, but it became a collectible in later years. acobs' next ABC album was 'All the Way...Love' issued in March 1979 and produced by another Motown song writer, Freddie Perren (the Corporation, the Jackson 5, the Miracles, the Sylvers, Peaches and Herb). More disco-oriented than his self-titled debut, it failed to chart. One Jacobs single, 'I Never Been Here Before,' was produced by former Crusaders member Wayne Henderson for Street City. Jacobs appeared in a national TV ad and toured in the gospel play 'Looking for Mr. Right' in 1999. As a session pianist / backing singer Lawrence has recorded with The Sylvers, The Impressions, Rick James and The Gap Band. He also had a leading role in the movie 'Young Blood' for which War recorded the soundtrack album, featuring a drawing of Lawrence prominently on the sleeve. ...why not take a listen to 'When We Can', taken from the album 'Lawrence Hilton Jacobs', right here. In "Teen Dream," A song he wrote for Born Late, Shaun Cassidy notes that he and his contemporaries are "a generation younger than rock & roll," a ripe, wise turn of phrase. A bit later, Cassidy refers to himself as "an overnight sensation/Dyin' for an explanation." Since Cassidy is an aural ringer for Eric Carmen, his reference to the Raspberries song is ingratiatingly nervy, but the entire sentiment is brave and touching: an admission of perplexity and doubt from someone who's negotiated a burgeoning career on his cocky American boyishness. Nothing on these four LPs is as good as "Teen Dream," but then television stars who make records are rarely so eloquent. These young fellows are the latest in a spotty tradition that extends from Ricky Nelson to Shelley Fabares to David "There but for the grace of chutzpah goes Neil Diamond" Soul. This tradition has always found a young audience that doesn't yet accept middlebrow prejudices against television or blatantly commercial pop rock. Since the youthful stars' video visibility guarantees a certain amount of sales, there's always the temptation to stuff an album with filler, and the singers' musical innocence often makes them more vulnerable to manipulation by bad producers and bad material. But this innocence is also a crucial asset, since lack of technique keeps complicated pretension in check. The rest of Born Late has lots of lows (some flaccid disco and a pathetic "Do You Believe in Magic?") and one more high: Cassidy's latest single, "Hey Deanie," an Eric Carmen song that sounds swell on the radio, all bounce and passion with a chorus that lilts into a heavenly hook. Generally, however, Born Late boasts puerile production by Michael Lloyd, a real smoothie laboring in the fields of Mike Curb Productions and specializing in hollow arrangements. Tinny horn sections and scrawny strings drag themselves across a vast studio desert. Occasionally, there's the oasis of a moderately loud electric guitar, but it always sounds computer programmed. Thanks to his new movie career, John Travolta is an even bigger star than Shaun Cassidy. As a singer, Travolta gives a good line reading, but there isn't much conviction on Can't Let You Go, his second LP. Travolta's in it for the fun, and that's all. He's got a voice that squints; it's as if he hopes to sharpen his phrasing and emotion by squeezing his larynx. Travolta's mouth did more for rock & roll when he are that double-decker pizza slice in Saturday Night Fever than it does on this whole record. If Leif Garrett weren't such a spunkykid, one might feel sorry for him. His TV show, Three for the Road, didn't last a season, and his singles are fleeting successes. At its best, Garrett's heavily produced voice sounds like Cass Elliott and Michelle Phillips singing in unison; at its worst, it sounds like my kid brother's. But therein may lie Garrett's appeal: an Everykid whose reedy yelp, offset by Boy Beautiful looks, stirs identification among his fellow pubescents. Certainly no oldster will stand for the limp desecrations of the Chuck Berry and Beach Boys standards that clog Leif Garrett. Michael Lloyd is again the mastermind of mediocrity, but, ironically, it's the producer's own composition that provides his singer with the LP's most telling moment. When Garrett's uncontrollably emotional voice meets Lloyd's sloppy self-pity, "I Wanna Share a Dream with You" is magically charged with real, if inexplicable, yearning. For sheer consistency, Lawrence Hilton Jacobs is easily the finest record here, and not just because it employs the best producer. Lamont Dozier sets up chugging rhythm tracks for the fast songs and swirls the strings around Jacobs' vocals on the slow ones. And Jacobs is a natural pro: a belter with subtlety ("Love and Understanding Is the Answer") and a soul crooner in the Eddie Kendricks mold ("Wonder Woman"). His phrasing is clipped and playful, edged with a DJ's purr. Jacobs' faults are his producer's: the vapid mooning of Dozier's writing and such filler as the turgid instrumental "Larry's Theme." Chances are good that if you're more than ten years old, you not only won't go near these albums but already avoid the radio stations that play this gang's singles. But at a time when these young men's most prestigious role models—popartistes like Eric Carmen, Neil Diamond, Barry Manilow and Leo Sayer — are victims of their own overweening ambitions, producing nothing but dull and pretentious schlock, Shaun Cassidy, John Travolta, Leif Garrett and Lawrence Hilton Jacobs may be more than capable of yielding up some honest, peppy music. Tradition is against their becoming artists with evolving careers. For every Ricky Nelson, whose sincerity is coupled with talent, there are dozens of would-be singing stars who simply luck into a good producer or song (Vicki Lawrence is a recent example). And then there are those who just overreach, as did David Cassidy on his last two overblown concoctions. But you never can tell. Someone should get Shaun a new producer. — Ken Tucker.